Tomorrow is World Food Day. This year's theme is "sustainable food systems for food security and nutrition." Reducing hunger around the globe is an ambitious goal, one the world recognized in a set of development goals set in 2000 and reaffirmed last month at a meeting of the UN General Assembly. Unfortunately, there are a lot of barriers standing in the way of that goal, from climate change to war to rapid population growth. Earlier this year, I visited Keur Moussa, a community about 60 kilometers outside of Dakar, Senegal, to learn how farmers are coping with climate change. Senegal has been designated by the US Agency for International Development as a priority in its Feed the Future food security initiative. In recent years, heavy downpours and high winds have eroded much of the soil in this once thriving community of farmers, and what soil remains is less fertile. 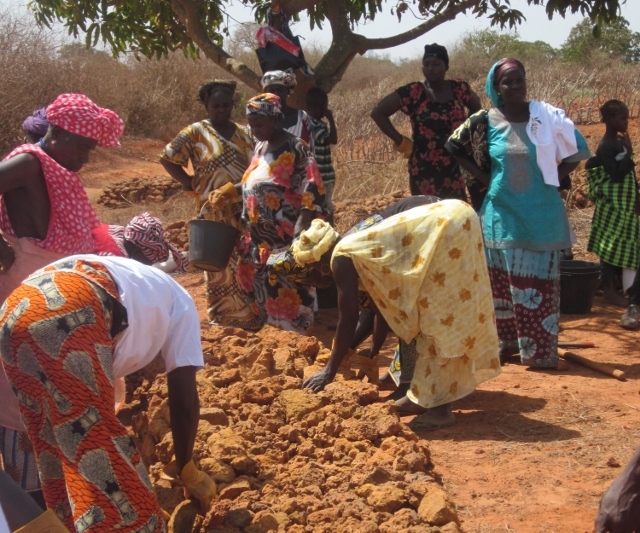 Most of Keur Moussa's men have left to try to find paid work in Dakar, and the women who are left behind are doing what they can to address soil erosion so that they can grow enough food to feed their families. When my colleagues and I arrived in Keur Moussa, we were greeted by a group of women, several with babies in slings on their backs, who were working together to build a dike by hand. They used buckets and wheelbarrows to gather rocks to form a barrier to trap rain from occasional heavy downpours. They were proud to show us what they accomplished together -- there were several dikes, hand-dug water storage pits, and vegetative windbreaks -- and they were hopeful that their next farming season would be better. Yet food security depends not only on the amount and quality of food available, but also on the number of people who need to share it. And unfortunately, planning families is not an easy thing for many women in Senegal. In fact, 30 percent of women there have an unmet need for family planning -- they would like to be able to wait a couple of years before having their next child, or end childbearing all together, but they lack family planning services. Addressing this unmet need can be life-changing for women. At the most basic level, it can literally save the lives of women and their children. It can allow young women to stay in school, multiplying their options and increasing their earning power -- money which is often invested back into the family. This is critical in efforts to reduce poverty and combat hunger in a place like Senegal, where almost half the population lives in poverty and 16 percent of children suffer from stunting due to undernutrition. And addressing women's unmet need for family planning can help to slow population growth, a critical factor in considering the sustainability of food systems. This could be particularly meaningful in Senegal, where demographers have estimated that the country will grow from 13 million today to somewhere between 29 and 37 million by 2050. The women of Keur Moussa, like millions of women around the world, are on the front lines of efforts to achieve food security and better nutrition for their families and communities. When their needs are met -- including their needs for family planning -- this year's World Food Day theme will be within closer reach.